Location: Alley West of Main St, Between 8th and 7th Ave. I met Aslam Bulbulia, the Coordinator of Community Engagement Initiatives at The Centre for Comparative Muslim Studies, for the first time last year at Buro Coffee in Gastown on a mild Tuesday afternoon in January. I was my usual overexcited self as he explained why he had reached out to us. It turned out there were a lot of ways VMF and CCMS could collaborate. In addition to tackling Islamophobia through art, our conversation covered topics ranging from our role in reconciliation with indigenous people as cultural producers and facilitators, public art and neighbourhood identity, and the difficulty of making connections in our (at times) isolating city. In leiu of these important issues, Aslam described to me the programming he and others at CCMS had been hosting in 2018. In the end, the mural that was produced built on the foundation of two programs at CCMS. “Being Muslim,” was a series of community conversations on what it is to be Muslim in the Lower Mainland and Introduction to Arabic Calligraphy and Islamic Geometric Design, where members of the public could learn the basics of these traditional designs and scripts. Doaa Jamal, to be the muralist for this project. Doaa’s professional expertise lies in creating dynamic visuals for individuals and organizations eager to understand their identity through the power of colour, shape, and symbolism. Doaa experiments with Arabic calligraphy and type; mixed media fabrication; and travel photography, all from her point of practice in Vancouver, BC. 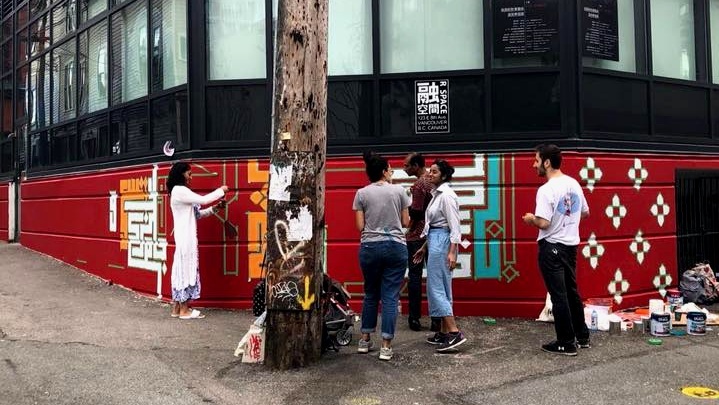 At VMF, we believe mural art is a powerful way to tell the unique and diverse stories of the people and cultures that call Vancouver home. Its so encouraging to see how Doaa has begun to make visible, and to celebrate Muslim visual culture as part of the festival. Her artwork utilized a modern version of the tradition Arabic Kufic script to convey a message of pluralism and learning from differences with a verse taken from the Quran - "We have created you from male and female, and made you into nations and tribes that you may know one another." 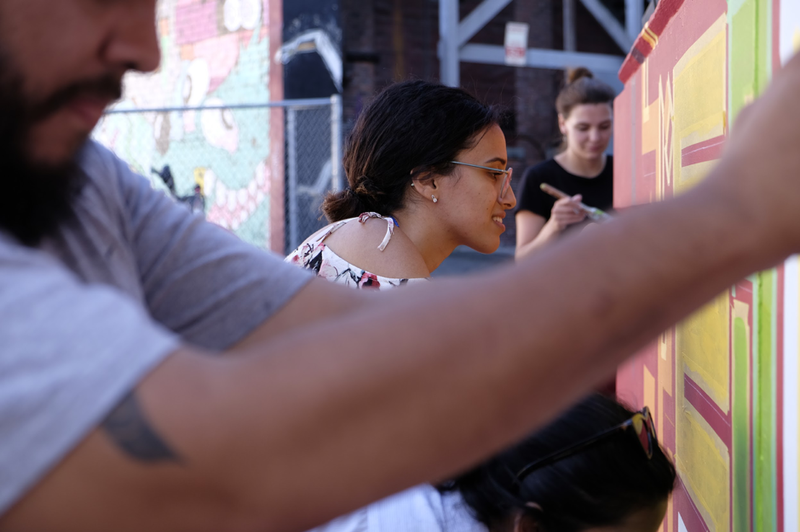 (49:13) In the weeks leading up to the festival, the mural became a hub of community connection as friends and volunteers came to help paint the mural and bring water and food to feed Doaa and the other artists. The excitement peaked at the festival's launch and we hope the area continues to be a point of pride and a place of connection for years to come. I am biased of course, but I think Doaa Jamal’s mural is amazing. It is powerful, eye-catching and beautiful. To top it off, “Why Can’t They See Us?” was Doaa’s first mural! 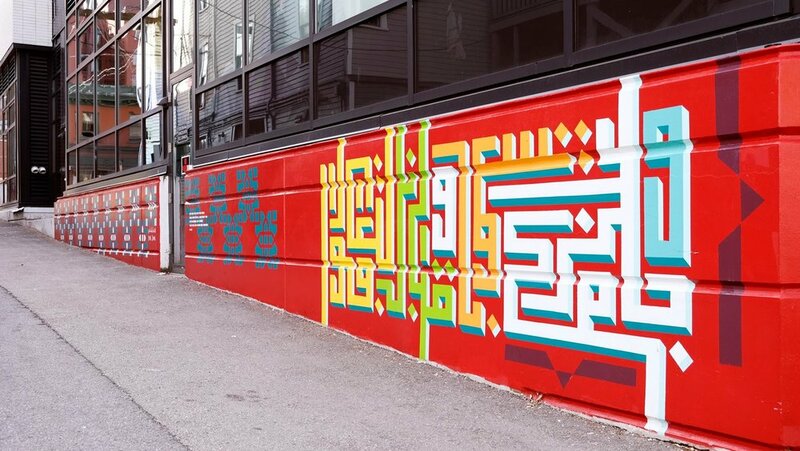 A 35’ wide Quran verse in multicolour Kufic calligraphy wrapping around and beneath the R-Space Art gallery in the laneway at 123 E 8th Ave, Vancouver. For more info on Doaa’s work, check out her website here. The wall, before Doaa got started. Look closely, you can see the damage that our resourceful production crew had to find a way to prep for Doaa’s incoming mural. Thanks Brit and crew! 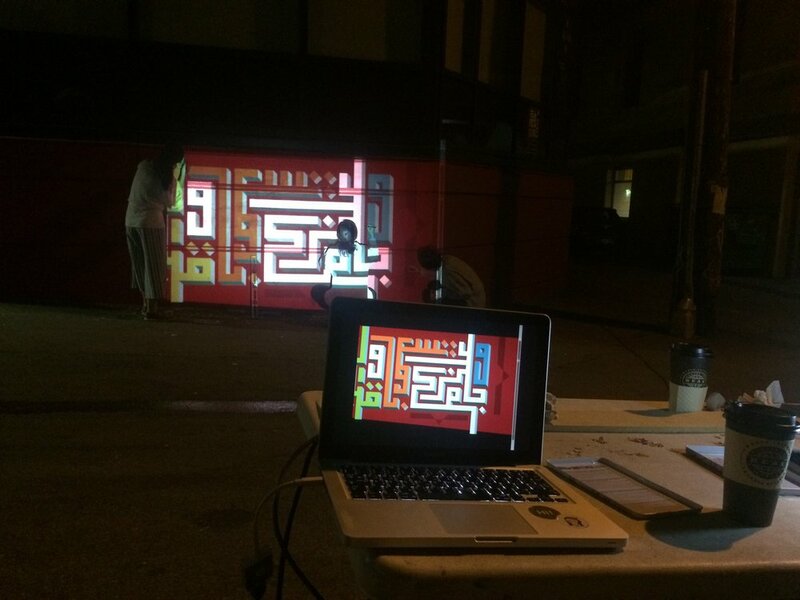 Nighttime projections of the Square Kufic Script. Doaa working alongside her loyal volunteers. The east facing side of the finished mural. Mural making party! Huge thanks to all the volunteers that helped out!